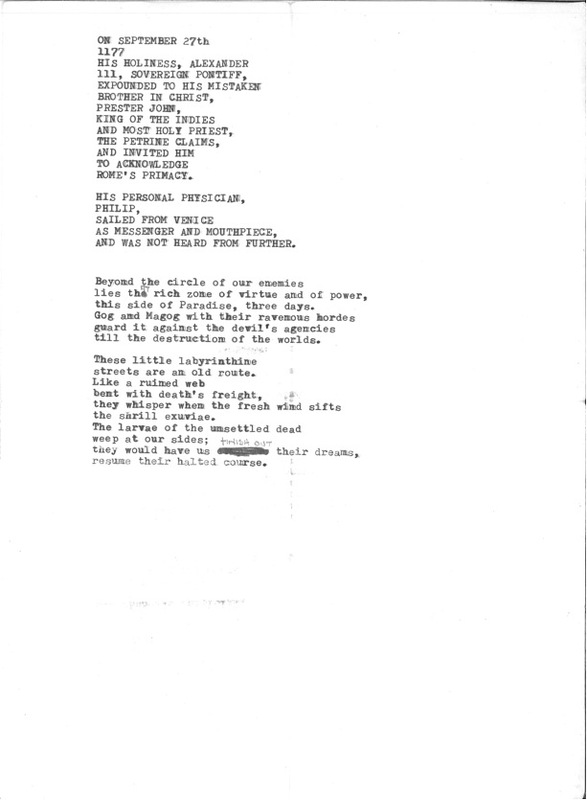 Editorial note: These two poems drawn from Trevor Joyce’s private archive were written during the near twenty-year lull in Joyce’s publishing history lasting from the late seventies to the early nineties. They are important as evidence of Joyce’s activity during this period and of the poet’s compositional process. “The End of Orpheus” was written in 1983 and has never appeared in print. Joyce was reading R. M. Rilke’s “Orpheus. Eurydice. Hermes” translated by Rika Lesser while writing this poem, and Rilke is one of a number of European poets important to Joyce’s oeuvre. 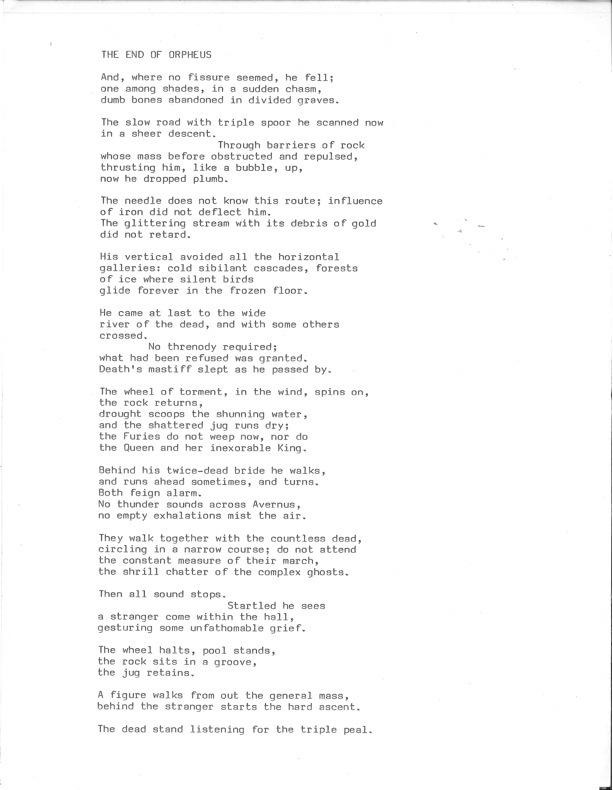 The second poem beginning “On September 27th” was written between 1976 and 1978 and first appeared in print appended to the “Pentahedron & others (1966–76)” section of the collected (2001). Along with the addition of the title, “Passages,” to the poem, there are a number of significant differences between the wording and form of the manuscript and print editions. The short opening lines in block capitals of the manuscript version are converted to an italicized prose style in the later edition. Changes to wording in the collected text include the insertion of “in the year of Our Lord” before “1177,” while “Rome’s primacy” becomes “the primacy of Rome” and “His personal physician” becomes “The Pontiff’s personal physician.” The hordes of Gog and Magog in the second section are “ravening” rather than “ravenous,” and the speaker’s alienation from “the rich zone of virtue and of power” is emphasized through the addition of “But, here” to “these little labyrinthine | streets.” Finally, the ten lines that conclude the poem in the manuscript edition are broken into two in the print edition with two sets of five lines.